Every competitive machine shop has a full range of machining equipment like lathes, drills, grinders and saws; presses, CNC lathes and machining centers, welders, plasma cutting tables and much more. So how does a machine shop guarantee an efficient and effective workflow on the machining projects it undertakes? One way is through attention to detail, and another through applying proper maintenance and shop standards. The key to getting high performance from your machining tools lies in detailed maintenance and checks to all of the working parts such as the spindles, which are the rotating axis on machining centers. Not being proactive when it comes to maintaining components such as spindles can cost you big time. Often excluded from a maintenance program, spindles are the workhorse of your CNC machines. They are the part that performs the action for every cutting stroke cut. Including spindles on your routine checks won’t add very much time to the process, but will ensure quality and profitability. Spindles are sensitive and a relatively technical part of your CNC milling machine, so maintenance needs to be performed by qualified and well trained staff or professionals, who have the expertise to properly diagnose and service them. Keep in mind though, that properly trained operators and manufacturers can prevent a lot of damage by operating machinery properly and with sense. There are a lot of things you can easily do to avoid spindle failure. One major consideration is reducing vibration of the work piece and the machining center itself. A simple vibration analysis can regularly be performed to ensure things are running smoothly. For smaller machine shops, investing in a vibration pen can greatly impact your production lines in a positive way. When using a vibration pen, consistency is the key to getting accurate readings, and again, accuracy lies in the hands holding the pen! 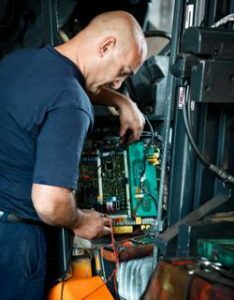 Operators must be trained to recognize problems in the early stages like rising temperatures, strange noises, or the quality decreasing on a work piece. Take the time to train your staff well, and take the time to maintain your CNC machines.